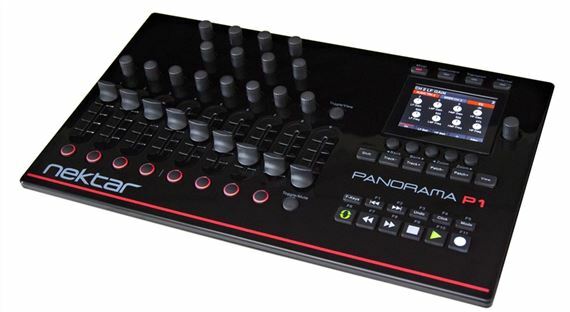 Shop Nektar Panorama P1 USB MIDI Controller from AMS with 0% Interest Payment Plans and Free Shipping. The Panorama P1 has spectacular, deep Bitwig Studio, Cubase, Logic Pro, Reason, etc. implementations, for a completely integrated experience. Along with vast MIDI programming options means you can focus on your music instead of the equipment. Set up your generic MIDI presets for instant recall when you need them. The Nektar Panorama P1 USB MIDI Controller provides 16 encoders, nine 45mm faders, 10 LED buttons, 28 buttons and a foot switch jack that give you spectacular, deep control over Reason and Cubase so you can focus on your music instead of the equipment! Set up your generic MIDI presets for instant recall when you need them or use Panorama P1 with Reason or Cubase for a completely integrated experience. Nektar has created a controller that puts great power at your fingertips! The enormous controlling power of Nektar Panorama P1 is contained in a compact case about the size of a 17 inch laptop. 16 encoders, 9 45mm faders, 10 LED buttons, 28 buttons and a foot switch jack gives you immediate control of up to 61 parameters at any one time. Settings can be stored in 20 presets with individually save and loadable F-keys maps for more than 1200 combinations. A crystal clear 3.5 inch color TFT display delivers the information you really need, for each mode or menu. Regardless of whether you are operating Cubase, Reason or programming MIDI assignments in Internal mode, the display provides detailed information that makes your workflow fluent and fast. Panorama P1 takes the hard work out of using a controller and makes operations that seem complicated and non-transparent on other products, straight-forward and simple. Setting up presets or F-keys maps is easy on the Panorama P1 controller. The Control Edit menu enables you to quickly select a control and in real-time assign the MIDI command you want. For each control values can be scaled, reverse and assigned specific or global MIDI channels. The chart shows the programming options available for each type of control. Nektar Panorama P1 features an extended 11 button transport bar, positions right where you need it controlling: Return to L, Forward to R, Undo, Click on/off, Record Mode, Cycle on/off, Back, Forward, Stop, Play and Record. Using the shift button, these also double up as 11 function buttons each assignable to MIDI commands or QWERTY macro's. Your software has a ton of features and functions that can be activated using QWERTY shortcut commands. Assigning a command to a button so you don't have to be near your computer makes life a lot easier. Assigning a string of up to 8 commands takes it to another level. With this powerful feature you could for example enter edit mode, zoom in and select a tool with just one button press. Or create an instrument or effects track and locate a folder containing your presets so you can select them from Panorama, all with one button press and without looking at your computer. For Cubase, Nuendo and Reason users, Panorama P1 is the ultimate controller. The dedicated communication protocol ties Panorama and your DAW tightly together so all you have to do is select the mode and menu you want to control. Three modes allows you one button press to switch between controlling the Mixer, Instruments (VSTi or Devices) and Transport, with the 4th mode, Internal, still providing access to traditional MIDI control. The integration with Cubase, Nuendo and Reason is so deep that you can immerse yourself in your music without having to constantly reach for the mouse. Panorama P1 gives you the creative freedom to just focus on your music. Reason ReWired to Cubase or Nuendo is a whole new experience with Nektar Panorama P1. Select which DAW you want to control straight from Panorama, in absolute real-time and regardless of what's in focus on your computer. Color coding clearly tells you which environment you are controlling so you don't get confused as you switch back and forth. Solid, versatile, and perfect for Propellerhead's Reason! The controls are robust and solid, which is great for such an inexpensive unit. Though it reduces the need for mouse and keyboard greatly, it does not completely eradicate their need. I wish that Nektar would either release an upgrade or an expansion unit that increases the physical controls so that the mouse and keyboard or even less focal. But, this unit is by far one of the best and most intuitive I've used.